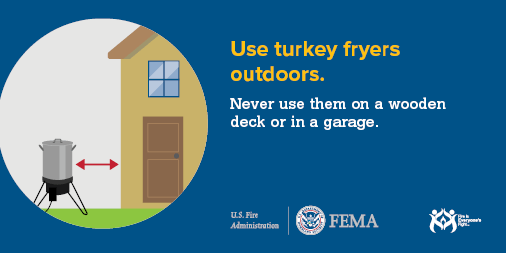 As you plan your Thanksgiving menu don’t forget about fire safety. Did you know Thanksgiving is the peak day for home cooking fires? The number of home fires double on Thanksgiving. So, let’s add a pinch of fire safety to the menu. Keep these safety tips in mind as you prepare your meal. If you are roasting your turkey, make sure you set a timer. This way, you won’t forget about the bird as you watch the parade or football. Use a fryer with thermostat controls. This will ensure the oil does not become over heated. Thaw your turkey completely. Ice on the bird will cause the oil to splatter. Don’t overfill the pot with oil. If you do, the oil will overflow when you add the turkey causing a fire hazard. Keep children and pets at least three feet away from the fryer. Also, always use the fryer outdoors. Stand by your stove when you are boiling your potatoes or frying onions for stuffing. It is best to stay in the kitchen when you are frying, boiling or broiling. If you are in the kitchen, it is easier to catch spills or hazardous conditions before they become a fire. Keep the area around the stove clear of packaging, paper towels, and dish cloths; anything that can burn. Be sure to clean up any spills as they happen. Be prepared. Keep a large pan lid or baking sheet handy in case you need to smother a pan fire. Turn pot handles towards the back of the stove so you don’t bump them. 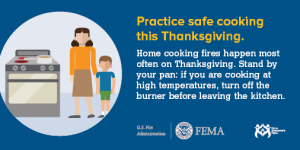 By following these safety tips, you will have a delicious and fire safe Thanksgiving. Let the firefighters have dinner with their families, not yours.